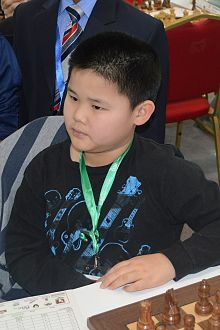 Awonder Liang (born April 9, 2003 in Madison, Wisconsin) is an American chess prodigy. On April 16, 2011, when he played in the Hales Corners Challenge chess tournament in Milwaukee, Wisconsin, Awonder became the youngest chess expert in United States Chess Federation (USCF) history with a rating of 2000 at the age of 8 years and 7 days. Awonder broke the earlier record by 64 days (which had been held by Samuel Sevian). On August 5, 2011, at the age of 8 years 118 days, he became the youngest to defeat an International Master (IM) in a standard tournament game. This occurred in round 6 at the US Open in Orlando, FL., when Awonder defeated IM Daniel Fernandez (rated FIDE 2401, USCF 2448 at that time). The previous record was broken by 4 months and 15 days; having been held by Fabiano Caruana. On November 27, 2011, he won the gold medal in the Under-8 Open section of the World Youth Chess Championship in Caldas Novas, Brazil. This win earned him the titles of U-8 World Chess Champion and FIDE Master. On July 29, 2012, he became the youngest person ever to defeat a Grandmaster (GM) in a standard time limit tournament game. It occurred in round 3 of the Washington International in Rockville, MD., when he defeated GM Larry Kaufman. Awonder was 9 years, 111 days old at the time, breaking the previous record by about 2.5 months. (The record was previously held by Shah Hetul at the age of about 9 years, 6 months.) At the same time, Awonder broke the USA record for the youngest to win against a GM by 10 months, 9 days; the previous record having been held by Fabiano Caruana who as of July 2015, was rated 5th in the world. On March 23, 2013, he became the youngest person ever to obtain a master's rating within the United States Chess Federation. While playing in the Midwest Open Team Chess Festival in Dayton, Ohio, his Round 2 win over a Life Master brought his estimated USCF rating to 2206. Awonder was 17 days shy of his 10th birthday at the time of this achievement, 10 days younger than the age at the previously existing record (by Samuel Sevian, 7 days prior to his 10th birthday). On September 2, 2015 Maximillian Lu broke Awonder's record by 12 days. On June 30, 2014, at the age of 11 years and 92 days, while competing in the 2nd Annual DC International, he became the youngest American to achieve an International Master (IM) norm. Liang earned his third and final IM norm in Dallas on November 25, 2015 at 12 years, 7 months and 6 days old, thus becoming the youngest American ever to qualify for the title of International Master.